Kids will love the super soft feel and slightly stretchy fabric, while parents will love the 100% cotton and Made in the USA tag. This is not the usual rough and scratchy pique polo; this is super soft that kids will actually enjoy wearing. Perfect for wearing as school uniform, for semi formal events, church, parties, playing tennis, dinners, etc. Why pay more for these polos? Simple, because you get what you pay for, period. These are QUALITY shirts made with the highest-quality materials, highest-quality stitching, safe, comfortable, and made in the USA. Trust us, your child will LOVE them and they will ask to wear them over and over again. They are perfect for sensitive skins because they contain no chemicals, are made with 100% super-soft cotton, and the fit is perfect. There is no substitute for giving your kids comfortable, safe, and good-quality clothes. It may even save you money because these items will last long and be worn a lot! COMFORTABLE - 100% super-soft cotton perfect for sensitive skins and children with SPD sensory processing disorder. Slight stretch perfect for active kids. Tagless. 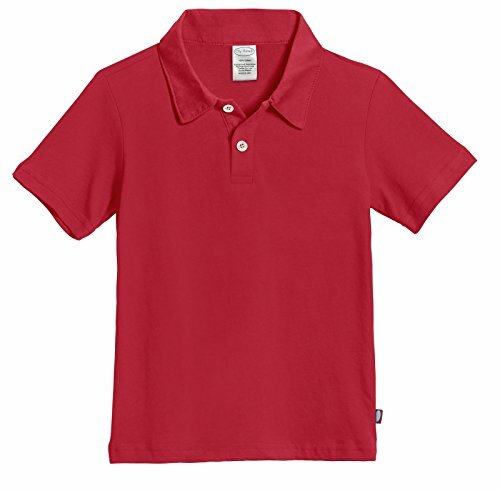 This is not the usual rough pique polo; this is super soft that kids will actually enjoy wearing. Perfect for as school uniform, for semi formal events, church, parties, playing tennis, dinners, etc. Why pay more for these polo shirts? Simple, because you get what you pay for. These are QUALITY items made with the highest-quality materials, highest-quality stitching, safe, comfortable, and made in the USA. SAFE - made from safe dyes and materials that won't cause irritation or itching. Perfect for sensitive skins and kids with SPD. Tagless. DURABLE - will save you money in the long run because they will want to wear them over and over again. They will last and retain their color.